marketing, where a standard marketing program is used in all markets. widely understood set of symbols. considering local actors and settings where the ad has been placed. Gillette, Coca-Cola, Ford, and Nestle among many others. for its new fragrance for men called La Coste a few years ago. was wearing pants in the ad used in others like Morocco. that advertising should be adapted to the needs of a society. countries are investigated, Morocco and France. other elements in the world; this is what he called “global village”. popular by the renowned sociologist Roland Robertson. the human capacity to bridge scales from local to global and vice-versa. itself all over the world working with local cultures and needs. African market dates back to 1992 in Casablanca (La Corniche). and its standard menu has been glocalised to accommodate local foods. 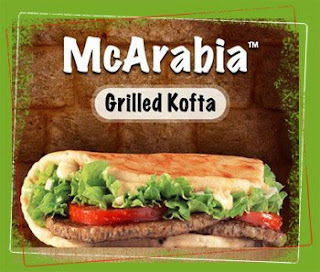 all wrapped in Arabic bread explains the McDonalds Arabia website. using the Arabic word ?????. advertizes by glocalizing the way in which its restaurants are used. are also provided with dates, milk, and Moroccan cookies during F’tour. after F’tour which transforms McDonalds to a “glocal” establishment. 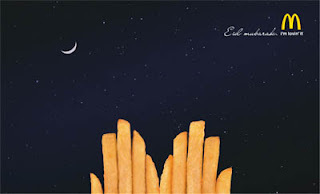 advertisement movies to wish to all Moroccans Mabrouk Ramadan or Aid. the King’s pictures in almost all McDonalds Morocco. respecting the culture, the religion and the expectations of Moroccans. in the food industry as clarified by Adam Wade in Aujourd’hui le Maroc. is strictly following home’s values and traditions. during the earthquake at Al Hoceïma. reached 2.2 billion Euros” as explained in McDonalds France website. air-conditioned, and 70% of restaurants open until 11 pm. same meals but different names that will suit the local market. and Onion recipe that offers the perfect mix as its advertising shows. comparing to only 25 ones in Morocco. 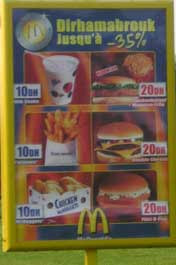 help integrate McDonald’s into French culture” (Murray Campbell, 2002). campaigning against the invasion of junk food”. and give them an emotional balance encouraging their rehabilitation. clearly shows that they are influenced by Western lifestyle. and the manner of nutrition, the number of meals and its timings. created the history, the weak ones just follow” stated Dr. Benajiba. anti-American protests by angry French farmers (Belch and Belch, 2001). development of Man and the respect of his environment. offers and encourage more people to come eat in its restaurants. would be “Order you meals by phone, and get them after 10 min at home”. In fact, the McDelivery already exists in some countries like Egypt. 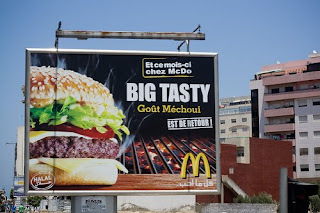 localizing McDonalds which lead to the notion of Glocalization.